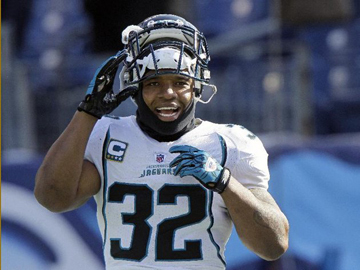 JACKSONVILLE, Fla. (AP) — One day after the Jacksonville Jaguars took a strong stance on Maurice Jones-Drew's contract situation, the star running back made his feelings equally clear. And he did it without saying a word. Jones-Drew skipped the opening day of a mandatory minicamp Tuesday, showing just how disgruntled he is about his current deal, and has no plans to join the Jaguars for any part of the three-day practice session. Coach Mike Mularkey can fine Jones-Drew up to $60,000 if he misses the entire camp. "Obviously I would have liked to have had him here a long time ago," said Mularkey, who declined to say whether he will levy a fine. "It's not like all of a sudden something's new. It's been the same case. I'm trying to focus on the guys that are here, similar in talking about the guys that do it right on the weekends. Basically the same thing. "The guys who show up here have gotten a lot done for us in all phases. Those are the guys I want to talk about. Write a good story about good things for them that are happening." Jones-Drew, who led the NFL in rushing last season with 1,606 yards, has two years remaining on a five-year contract worth $31 million. He is scheduled to make $4.45 million this season and $4.95 million in 2013. Coming off a career year, Jones-Drew wants to be one of the league's highest-paid backs. His contract currently ranks eighth among NFL backs, behind Minnesota's Adrian Peterson, Tennessee's Chris Johnson, Philadelphia's LeSean McCoy, Houston's Arian Foster, St. Louis' Steven Jackson, Carolina's DeAngelo Williams and Seattle's Marshawn Lynch. But Jaguars general manager Gene Smith made it clear Monday that the team has no plans to renegotiate with Jones-Drew, setting the stage for a potentially lengthy holdout. "He has expressed that he would like to renegotiate and we have expressed again that we feel he has a contract with two years left that we expect him to fulfill those obligations," Smith said. The Jaguars, meanwhile, paid him based on the expectation that he would flourish as a starter after spending the first three years of his career splitting carries with Fred Taylor. And they don't want to set a precedent of renegotiating with players who have two years remaining on lucrative deals that included big signing bonuses. Jacksonville also might not be enamored with paying a running back into his 30s, especially one who takes as many pounding hits as Jones-Drew does. "Guys are going to try and posture themselves to have an advantage because this career is short, especially for running backs — their shelf life is seen as short — so there's points that can be made on both sides and they're both perfectly valid," guard Uche Nwaneri said. "He's the face of the franchise, no doubt. But the NFL is a business. "Just like coaches got to make tough decisions, GMs got to make tough decisions and players have to make tough decisions. It's tough for him to make that decision that I'm not going to be show up here and be with my teammates and be out here working and learning this new system. That's a tough thing to do. ... We want everything to end up being resolved." The Jaguars have missed the playoffs each of the last four years, but with new ownership, a revamped coaching staff and added playmakers on the NFL's worst offense, they feel they are close to turning things around. And Jones-Drew is a key to getting it done. "The unfortunate thing is that he's not here," cornerback Rashean Mathis said. "We know he's getting his work in. We know he's working hard, but to be with the team is the main thing. Whenever he gets here, we will greet him with open arms."